I don’t like the concept of “going on a diet.” This suggests something temporary! In fact, my concept of dieting is dying by avoiding food. We need to eat to live, and we live healthily by eating healthily. And healthy eating is a lifelong commitment. Unfortunately, some diets don’t necessarily stress eating healthy foods, like fruits and vegetables, but mainly stress cutting calories. For example, you can have that chocolate cake as long as you don’t go over 1,200 calories in a day. 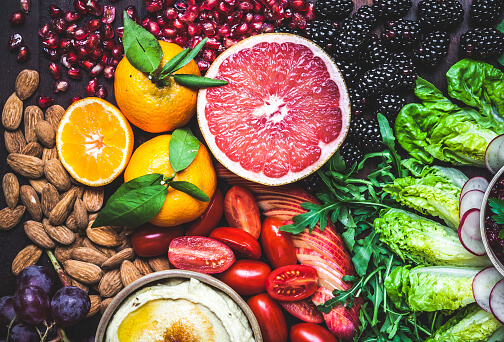 Diets like these will likely leave you feeling deprived and hungry, because they neglect the fact that you need to fuel your body with essential nutrients from the best foods possible. However, one diet I may be able to get behind is what has been referred to as the volumetrics diet - a diet which focuses on the foods you eat as opposed to the number of calories ingested. So what if you essentially didn’t have to worry about calories? This is pretty much what the volumetrics diet is about. Instead of restricting your food intake and obsessing over calories to lose weight, this diet is all about low-calorie, high-volume eating. The more low calorie density foods on your plates, the less you have to worry about eating too many calories. This results in being able to eat more food and feeling more full and satisfied. For example, just one cup of penne pasta has 352 calories. But you can eat several cups of mixed greens without even having to worry about how many calories are in it. You can also add cucumber to the mixed greens, once again not needing to worry about calories. So, you would probably feel more full if you had a chicken breast with the greens and cucumber as opposed to a chicken breast with a cup of penne pasta. In addition to this, you could have a cup of berries for dessert with the first meal. But if you “spend” 352 calories on one cup of pasta, you have to start being mindful of your calorie intake if you want to lose weight. It’s all about focusing on food quality instead of food quantity. With the volumetrics diet, you are giving your body the nutrient-dense foods that it needs. This does not mean that moderation goes out the window. Fruit contains a lot of sugar, so it wouldn’t be good to eat unlimited amounts of it. But it does mean you can eat more, because you are eating healthily. You can eat a decent sized proportion of fruit and consume these calories, but “spend” the same amount of calories in just a few sips of soda or a few pieces of candy. Another example would be that you could eat an entire avocado (which is pretty high-calorie but a good source of healthy, unprocessed fat) versus just a handful of potato chips (which are processed and void of nutrients). Which do you think is going to make you feel fuller for a longer period of time? “Low energy density foods contain more water, protein and fibre, and result in bigger portion sizes when compared to higher energy density foods, and have the effect of reducing hunger pangs,” according to one report discussing a study that found people who ate low energy density meals consumed on average around 1,000 fewer calories a day. The study involved female participants, and the women who did not follow the low energy density meal diet had to limit themselves to 1,400 calories a day. (To be clear, if you were to follow the low energy density meal plan you may also not exceed 1,400 calories a day, but the point is that you will get to eat more food and feel more satisfied). “A lot of people give up on diets because they feel hungry between meals. Our research shows that eating low energy density foods can help overcome that problem,” said one of the lead study authors. The women on both diets lost weight, but the women on the diet with low energy density foods were more likely to lose “clinically significant amounts of weight” (more than 5 percent of their body weight). Another study supports the idea that it is better to choose healthy foods than to try to eat less when it comes to losing weight. The study showed that people eat more as portion sizes increase, however, people trained in healthy eating and how to manage food proportions choose healthier foods and, as a result, eat fewer calories. "All the groups were served the same meals, but their food choices differed. The participants who went through the training consumed more of the lower calorie-dense foods [like salad] and less of the higher calorie-dense foods [like garlic bread] than the untrained controls," said one of the leads on the study. I am not saying you have to completely give up some of your favorite foods. We all deserve the occasional treat or cheat meal. But when it comes to losing weight, restriction is not necessarily the best method. Think about healthy foods you can add to your diet as opposed to what you can’t have. You may find that you actually prefer this method of eating and feel much better. As with any diet, discuss with a competent healthcare professional what is best for you. And remember to ensure you include appropriate amounts of those specific nutrients in your diet which may aid in weight loss.